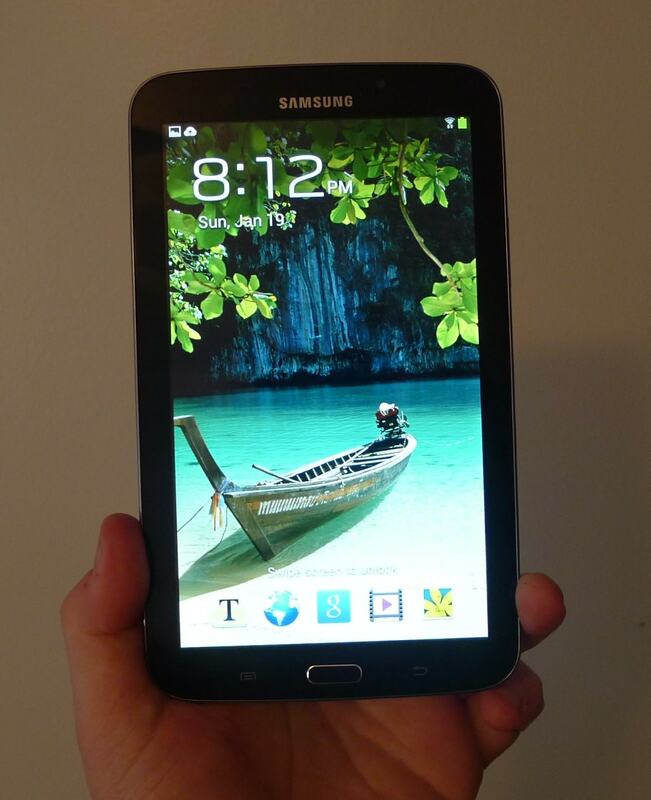 The Galaxy Tab 3 7.0 is Samsung's 4th 7 inch tablet, and it is their second tablet to be priced as a competitor to the Kindle Fire. It was originally released in mid-2013 with a $179 price tag, making it nicely competitive with the then $159 Kindle Fire. I picked up this tablet at Best Buy in January 2014 for $139 (the same price as the Kindle Fire HD 2013), and I am reviewing it in comparison to the $99 to $149 budget tablets I have reviewed over the past few months. The Galaxy Tab 3 7.0 is the smallest of the 3 Galaxy Tab Android tablets that Samsung released last year, and it's largely the same device as the Galaxy Tab 2, with a few small improvements. The most visible change is the smaller bezel to the left and right of the screen. This makes the Galaxy Tab 3 look more like Samsung' smartphones, but I think that was merely coincidental. I think the important result of this change is that the Galaxy Tab 3 is somewhat smaller than it was before; it's now tiny compared to the Kindle Fire HD or Hisense Sero 7 Pro, and you can actually make this tablet disappear under one of its larger competitors. 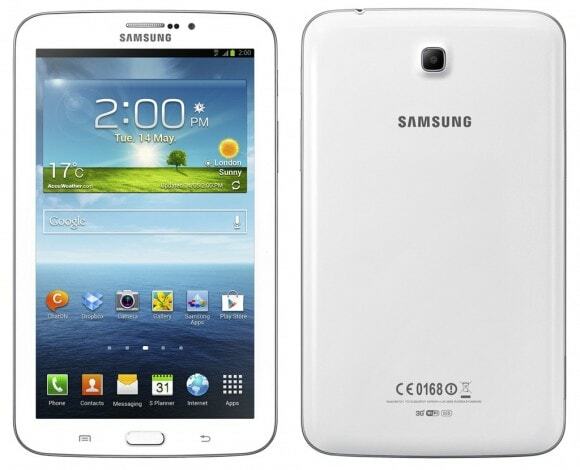 The Galaxy Tab 3 is available in white, brown, and black. I chose the latter model because I knew that the shell would be shiny and that the white shell would be the one most likely to show fingerprints. My tablet looks much like the one pictured above, only it has a glossy black rear and glossy front shell with a strip of gray trim around all 4 edges. On the bottom edge you'll find 2 speakers and a USB port (it replaced the proprietary docking port found on the Galaxy Tab 2). There's a microSD card slot on the left edge, a headphone jack on the upper edge, and on the right edge are the volume buttons, power buttons, and the IR blaster. All in all this is the lightest and smallest of the budget 7" Android tablets I have reviewed, and it is also one of the best in terms of construction quality. I find it much easier to grip by the edges than any other 7" tablet which I have reviewed. But as much as I like the size, I don't care for the slippery back or the glossy front. I am constantly afraid that I might lose my grip, so much so that if I were keeping this tablet I would invest in some type of peel and stick rubber strip to add to the rear of the tablet. A skin might also help. I can understand why Samsung would want to have a similar design aesthetic for all of their tablets and smartphones (and smartphones and smartphones and smartphones), but now that I've had this tablet in my hand I question whether that was a good idea. The Galaxy Tab 3 has 2 cameras, a 3MP rear camera and a 1.3MP front camera. Samsung caught a lot of flack from some reviewers over the cameras, and they're honestly not as good as the cameras on the original Galaxy Tab. But do you know what? This tablet costs a heck of a lot less than the original Galaxy Tab, and cuts had to be made in order to achieve a lower price. The important point here isn't the lower resolution but how the camera compares to cameras on other tablets in this price range. Very well, actually. The Galaxy Tab 3 might not have a camera as good as on $200 to $300 tablets like the Nexus 7 (2013), but it's a better camera than you would usually expect on budget tablets. In fact, it would out-score the higher resolution camera on the Hisense Sero 7 Pro if not for the fact that other tablet has a Flash. Part of the reason why the camera on this tablet is so good is that it is complimented by Samsung's well developed camera app, which offers more exposure, resolution, and effect options than the stock Android camera app. But the cameras also have a decent sensor, which is not something you can say about most budget tablets. I have taken a few fairly good photos with the 1.2MP webcam, but I was unable to take a good photo with the 3MP rear camera. I think mine was defective, so rather than post bad photos I will instead link to ones posted elsewhere. Like many other budget tablets, the Galaxy Tab 3 has a screen resolution of 1024 x 600. It's the same resolution as on the original 2010-era Samsung Galaxy Tab, which has led to a lot of griping by tech bloggers. If you've been reading other reviews then you may have read complaints about the "pixelated" screen resolution. I tend to think those reviewers are fools, but to be fair they reviewed this tablet when it cost a lot more so they expected the screen on this tablet to meet a higher standard. As a budget tablet screen, it's great. It has a viewing angle as wide as the screen on the iPad, good color, and it literally makes any of my other budget Android tablets look bad in comparison - with one exception. As good as this screen is, it still has a lower resolution screen than the screen found on the $139 Kindle Fire HD (2013). That does not bother me, but if you are after pixels then it might bother you. Moving on to the touchscreen, I found it to be exceptionally sensitive, more so than any other tablet in this price range. It was especially good at interpreting my attempts to use the onscreen keyboard. 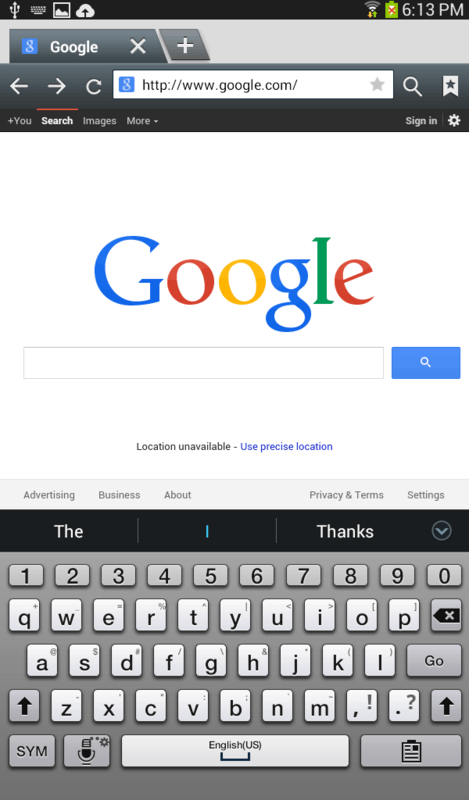 Samsung packages their own keyboard software into the Samsung Galaxy Tab 3, and in many ways it is better than the stock keyboard available in Google Play. It includes a handy dedicated layer of numerical keys along the top, savng me the effort of having to switch between different keyboard screens while typing. The Galaxy Tab 3 is running Android 4.1.3 Jelly Bean with a sprinkling of Samsung's proprietary code mixed in. This isn't the latest version of Android, and that means if you buy this tablet you'll be missing out on a number of the latest improvements. But that's not unusual for budget tablets, almost all of which re running Android 4.2 or Android 4.1. 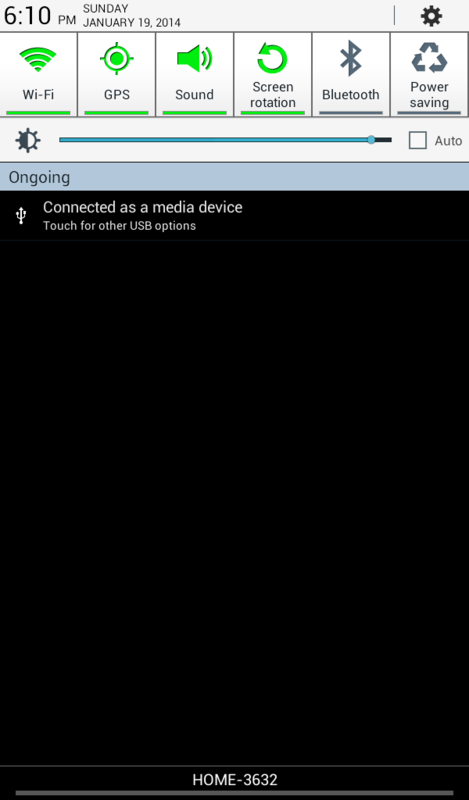 Of course, this being a Samsung tablet, you get the by-now-familiar TouchWiz UI layered on top. It's easy enough to use, but TBH it's not any better than what you might find on a cheap Android tablet or one of the more polished models like the Hisense Sero 7 Pro. And like a number of tablet makers (Hisense, for example), Samsung has also replaced the lock screen with a custom one which lets users either swipe anywhere to unlock or quickly open any of 5 apps. The home screen shows some signs of Samsung's customizations, and I'm pleased to report that it's actually missing much of the clutter that can be found on competing budget tablets. There are a lot of widgets, though (they're the new icon clutter). By default, Samsung has filled the top third of each page of the home screen with a widget (which can be deleted or replaced easily). If you do a pinch-zoom on the screen you'll see that there are three home screen pages by default (you can add more if you like), all accessible on an endless carousel and accessed via a lateral swipe. That's a little different from stock Android, which usually has 3 or 5 pages in a row (1-2-3-4-5). There is a different widget on each of the 3 screens (AccuWeather, Flipboard, Samsung Music/Game Hubs). They are of course removable, and it's easy to add your own app icons and widgets to the home screen. You can do that using the exact same steps as any other Android tablet. Simply open the apps menu and then drag and drop the icons or widgets onto the pages of the home screen. Samsung has a reputation for a great user interface on their tablets, and that was part of what inspired me to get this tablet and write a review. I've been reading about Samsung's latest and greatest, and I even got my hands on the new Galaxy Tab Pro tablets at CES 2014, so I was quite eager to see just how much work Samsung put into the Galaxy Tab 3. There's actually little to recommend the Samsung tablets over their competition. While I am sure there are numerous under the hood improvements, the interface for this tablet is dated and somewhat clunky by today's standards. For example, the most notable feature which Samsung added was the row of quick access buttons on the notification menu (the one you pull down from the top of the screen). That feature was very useful on the original Samsung Galaxy Tab that I bought as refurb in late 2011, but it's frankly less useful now than what you can find the stock Android 4.2. Pick up just about any budget Android tablet and you'll see that most will have 2 different menus which can be pulled down from the top of the screen; one (on the left) is the notification menu and the other is a shortcut menu (on the right) which with links to screen brightness, Wifi, airplane mode, battery life, and more (it varies between tablets). Samsung has largely been treading water with the design of their interface, and if they don't act quickly to update it (or simply replace it with stock Android) it's going to look awfully cheesy on their next tablet. Moving on to apps, the Galaxy Tab 3 ships with a fair amount of bloatware. It of course is inflicted with the full suite of Google apps, and it also has all of Samsung's apps (email, S Voice, S Planner, media stores, etc) which largely duplicate the functions and features of the Google apps. All that bloatware cuts into the amount of storage, reducing it from the 5.5GB you might have on some tablets to only 4.9GB. When you buy a budget tablet you have to accept that you're not going to get a performance equal to a premium tablet. It's simply not possible to get a low price without cutting a few corners, and that is certainly true in the case of the Samsung Galaxy Tab 3. With an Antutu benchmark score of 11380, the Galaxy Tab 3 Pro rates lower than many other similarly priced tablets (the Hisense Sero 7 Pro, for example). According to the test results its biggest shortcoming is a weak CPU, and that matches with my experiences. For the most part the performance could be described as acceptable but unremarkable, but after having used the tablet for a week I think I would describe it as flaky. This tablet has a tendency to go to sleep and forget whatever I was doing last; when I wake the tablet it is instead showing the home menu. The screen has also occasionally flickered for no apparent reason, and I have read a couple reviews that complained about the tablet crashing and requiring a reboot. I'm not used to seeing these behaviors from budget tablets, which is why I describe it as flaky. This tablet has also come up short in the streaming dept. One of the stress tests I (now) run when I review a tablet is to try to stream Amazon Instant Video (using this trick); I see this as a way to test the combined performance (download speed, memory management, CPU, graphics). Most budget tablets can handle browsing adequately, and most can play a video or stream from Youtube, but not all tablet are up to the task of streaming video from Amazon. The Galaxy Tab 3 is one of the tablets that isn't quite up to the task. Sure, the trick worked, but the streaming video repeatedly hung and had to be restarted. I think that this is a sign that the Galaxy Tab 3 really does have a weak CPU. Samsung's pursuit of a budget price tag resulted in a tablet that is definitely not the best device in its price range. But to be fair, none of these problems are severe enough to raise a red flag, but they are enough to make me decide to get another tablet - one like the Hisense Sero 7 Pro, which has fewer issues. Thanks to its svelte size, the Galaxy Tab 3 is going to be easier for most people to hold in one hand than most 7" tablets. It has the volume buttons conveniently placed on one edge, putting them under my forefinger when I hold the tablet by the edges. I've been reading on it this past week with the Kindle app (I'm working my way through the Game of Thrones omnibus). It works well as a reader, though I am concerned about maintaining a good grip. This is a slippery tablet. It's a good thing it's not any larger otherwise I would be afraid to carry it around. I ran my usual battery stress test on this tablet and I was a little surprised by the result. The Galaxy Tab 3 might be the smallest and lightest of the budget tablets I've reviewed but it clearly shows the value of the Samsung brand. I would estimate that this tablet should be capable of playing video for 9 hours or more. And that's with the Wifi and backlight on; turn them off and you should be able to stretch out the battery life even further. Nine hours of battery life is much better than any other budget tablet I've tested. The only tablets that come close are the HP Mesquite, a $99 tablet, and the Hisense Sero 7 Pro ($149). Those tablets had 5 hours of battery life, which says a lot about the work Samsung put into this tablet. Samsung's budget tablet is clearly the prettiest device in its price range. It's both the smallest and lightest 7" tablet under $150, and it boasts the best battery life. But is it the best value? That's another matter. After a week of usage, I would have to say that the Galaxy Tab 3 has 2 redeeming features: looks and battery life. The first matters little, IMO; cost and functionality is worth more to me. And since this tablet doesn't have noticeably better performance than other budget tablets, that's not a deciding factor. But battery life, on the other hand, counts for a lot. If you need battery life more than anything then this is your tablet. I doubt I will encounter another budget tablet with similar battery life - not until Samsung releases the next Galaxy Tab 7". And if you are in need of a second opinion, here is a video review. Thanks for the review, Nate. One problem, you keep recommending the Sero 7 Pro, but no one is currently selling it. Walmart lists it as “in store only”, but the stores don’t have any either. Well, shoot. Even Amazon is out of stock. I didn’t realize they would be hard to find; I think Ebay is pretty much the only place to find them. The cheapest I found just now is $139 at Amazon.com for the white unit. I have a hard time considering a tablet with a 1024 x 600 resolution, despite the fact it may be perfectly fine for reading on. Maybe it is all in my head……….. The GT3 8.0 is 1280 x 800, but over an 8″ space, which means a lesser pixel density than, say, the latest Google Nexus7, but after many, many tablets passing through my hands, I’m okay with lower pixel density, more room for my fat fingertips, and less weight so I can read a novel. (I DO NOT GAME, thangyewverymuch). In fact, last night I dragged out an old Archos resistive-screen model, and I think there’s still something to be said for reading the NY Times with one’s fingernail. Or a stylus. There’s something to be said for using the tiny tip of a plastic stylus when manipulating a touchsscreen.